In the lot tucked between Castlemont High and Center of Hope Church along MacArthur Blvd., three women are pulling down the flap of a pop-up tent. It’s an extra task, one of many, on this drizzly Friday morning. 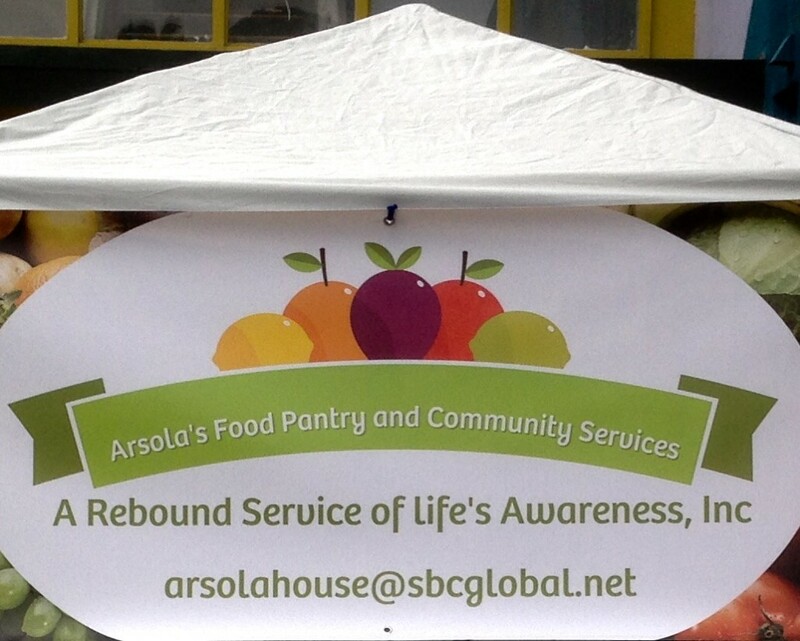 They are preparing for this week’s food distribution at Arsola’s House Food Pantry, still two hours away. Howard, like several of the dozen volunteers who shy away from photos and give only first names, has already stacked a row of tables with fresh produce across the back of the lot. Today’s bounty, brought over in volunteers’ vans and pick-ups from the Lincoln Square Safeway, includes mushrooms, red and green pepper, chili peppers, broccoli, lettuce and string beans. These tables will form a right angle with the three pallets of fresh apples, oranges, cauliflower, zuchini, celery, potatoes, yams, and onions delivered by the food bank an hour later. At the corner entrance of the building, once a charter school, Maria sorts through clothing and shoes as she sets up an attractive display. Slightly wilted easter lilies, perfect for pruning and planting, fill a corner of a courtyard, and are there for the taking. Arsola — an acronym for A Rebound Service of Life’s Awareness and also the name of the mother of pantry coordinator Candi Thornton — has been one of the 240 Alameda County Food Bank’s distribution sites for more than five years. Up to 125 guests do their weekly shopping every Friday (except the first Friday of the month) at Arsola’s, where it’s as much about the shopping experience as stretching tight budgets. As Ronnie Benson told me later, “I always look forward to coming here. It’s good exercise, it’s a great help and it’s like family here.” Benson comes with her son and pushes her walker over from their home several blocks away at 83rd and Bancroft. Twenty guests at a time arrive at their appointed times, scheduled at 30- minute intervals by phone calls made earlier in the week to the food bank. Shoppers, who comment on the orderliness of the line, are warmly greeted and checked in by Kat at the gate before being guided downstairs to the comfortable waiting room. Elderly folks have the option of a volunteer selecting items for them, a sort of valet shopping, but just about everyone wants to make their own food choices. Five people at a time are guided to the neat, well-stocked pantry down the hallway. “Got Milk?” posters hang on the wall along with reminders to take just one item per shelf. Mozelle “Momo” Fontenette, who comes in during the week several times to organize the shelves, is always on the move. “Being ready, that’s what it’s all about,” she says. She keeps an eye on supplies as six other volunteers help folks make selections and re-stock each of the half dozen stations filled with grains and spaghetti, canned goods, tuna, cereal, bread, salad dressing, packaged drinks, and pastries. Items such as eggs, milk and a wide assortment of cupcakes, pies and even small sheet cakes are refrigerated until shoppers request them, to prevent spoilage. This station is particularly busy the third Friday of the month, when packaged meat and fish are available. The cheerful young man who earlier lifted shoppers’ empty carts down the stairs now hoists the much heavier ones back up about 15 minutes later. “It’s how I stay in shape,” he says. Thornton, no doubt, brings the same presence to her day job, running Arsola House (www.arsolahouse.org), a short and long term shelter and residence for 37 men and women, many with a range of special needs. Some of her residents have been with her since she first opened the shelter’s doors 17 years ago. Many of the pantry’s guests bring their carts from long distances by bus and foot. One disabled man told me that he walks nearly 20 blocks to save money for his medical prescriptions and $700 monthly rent. Alecia Arnold comes from 15 blocks away. “Everyone here is so respectful,” she tells me. “The gentlemen help with your bags and baskets. There’s nutritious foods. The people line up so nice and orderly. I can’t tell you how much I look forward to coming down here,”she said. 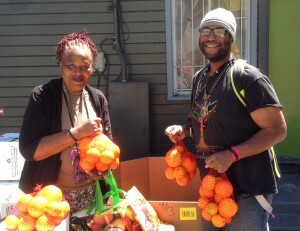 (Arsola’s House Food Pantry, recognized as Pantry of the Year 2014, runs strictly on love and donations and can be reached at PO Box 5520, Oakland, CA 94605. You can talk to Candi Thornton directly at 510-830-7851 or email arsolahouse@sbcglobal.net). I live in Pensacola, FL and we too need community services such as this within our inner city, and county. I would like to congratulate Ms. Thornton and the staff at Arsola’s House for 17 years of dedicated services to the Oakland community. One of the best food pantry in Oakland, Thanks to Arsola’s Ms. Thornton and her great Volunteers, Your are a true leader of our community. 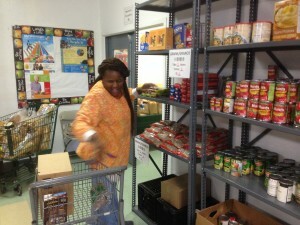 One of the best Food Pantry in Oakland. 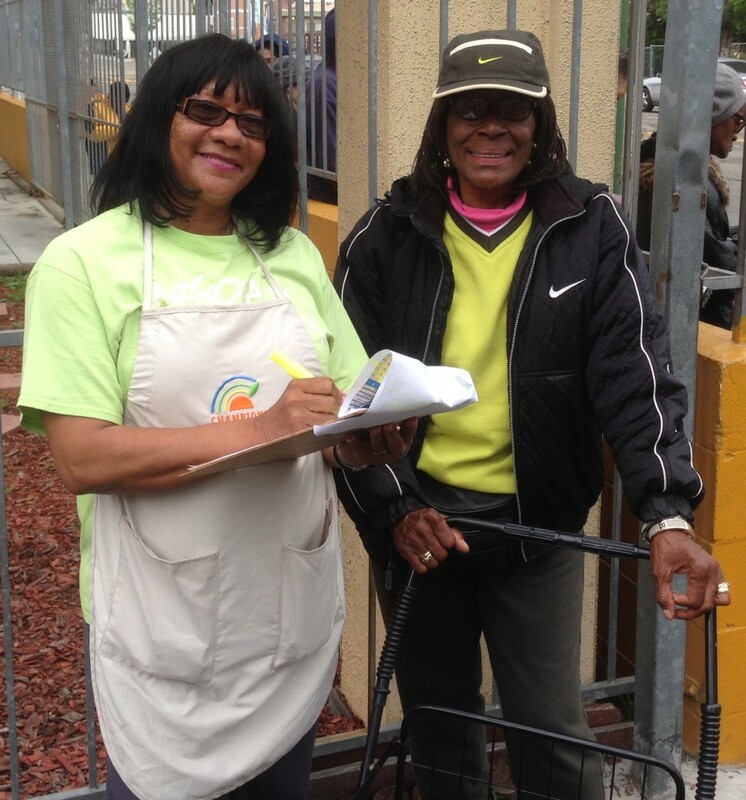 Arsola’s Pantry and its volunteer’s are a leader in providing good and healthy foods for our community. We appreciate Ms. Thornton for her true commitment to Our Community. I love this pantry! So proud of all they do & forever thankful for how they are so in touch with the Oakland community. 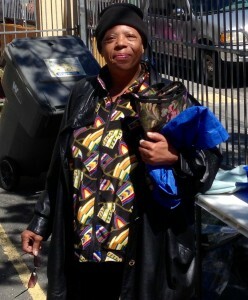 We need more leaders like Ms. Thornton & her volunteers to bring Oakland right back up! Great article!